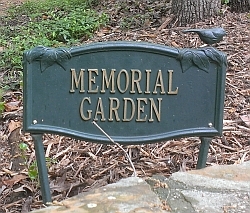 The Memorial Hillside Garden was established on the site of the Chapel Hill Friends Meeting in 1988. A specific area was selected and approved by the Meeting. The original concept was to establish a memorial garden in remembrance of those of our members and attenders who have passed away. It is not a licensed cemetery and there is no guarantee that it will remain a garden in perpetuity. It is only a garden. The map on file was drawn in 1993 but apparently no guidelines were ever recorded. Care and Counsel Committee members work with families to make arrangements when a member or attender dies. In 1998 it became clear to Care and Counsel that the Meeting needed to have a permanent record of the names of persons whose remains are deposited in the garden and also to have a written set of guidelines governing the use of the Memorial Garden. This is necessary in order to have consistency and uniformity in our procedures as well as to assure that we adhere to the legal limitations. Following the work of an ad hoc committee consisting of Elizabeth Cooley, Lois Ann Hobbs, and Nancy Bless, to draw up a preliminary set of guidelines, Care and Counsel brought the following guidelines to Monthly Meeting for Business for its approval. Only cremated remains of members and attenders are permitted. Ashes may be scattered in the ground or in those surrounding woods belonging to the Meeting. Alternatively they may be buried in a biodegradable container. Containers must only be large enough to accommodate ashes and should be deposited on end so as to occupy less ground level space. No individual memorial stones or plaques are permitted. If possible, provision for side by side deposit of remains for couples will be made if requested. Any memorial plantings must be wooded, natural, and of such a character that they can be disturbed as space is needed. Space does not allow for large plants. All plantings must be easily maintained and must be approved by the Building and Grounds committee. Copies of the map showing approximate locations of individual remains may be given to families if requested.